Hauling Wood, ca. 1907-1928. Photographer unknown. Photo courtesy of the Maritime History Archive. Harvesting wood for the winter was imperative to the survival of Newfoundlanders in the past. Everyone had a woodstove, and that was how you kept warm in the winter months. 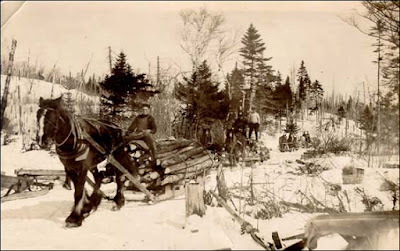 In the early twentieth-century logs were hauled from the woods by horse drawn sled (as seen in this photo). Do you have memories of cutting or hauling wood?